It’s Father’s Day this Sunday: a time to remember, acknowledge and celebrate dads everywhere – and maybe to share a glass of his favourite whisky at the same time. We could give you some half-baked recommendations of whiskies to buy the old man, but who are we to tell you what he likes to drink? So, instead, we’ve asked a few whisky people for their own Father’s day reminiscences. Thanks to everyone who took part – and happy Father’s Day! ‘Unfortunately I was never able to share a whisky with my dad as he passed away before I could legally drink. However, growing up at Macallan distillery (they just knocked down the house I grew up in to build their new distillery – not that I am bitter) there was always plenty of whisky flowing – whether it be the joyful smell of whisky coming from my dad after yet another usually unsuccessful evening of fishing on the Spey, or nights with family and friends where special bottles got opened and drunk without anyone noticing, simply because the boxes looked similar to the 10-year-old. ‘One story that sticks in my mind was from a warm summer’s day when mum and dad had just moved to Speyside. Dad and a friend were chopping wood – thirsty work – and dad grabbed a lemonade bottle, took a large swig and nearly knocked himself out as it was new make spirit in the bottle – welcome to Speyside! ‘My grandfather established a specialist blending, bottling and brokerage in 1933, which my father took over in the ’50s. Whisky has been something I have grown up with, and I regularly visited my father’s bond. ‘Seeing the bottling hall and understanding how the wood of the cask influences the taste of the whisky fascinated me. It was the place where my passion for Scotch whisky began to awaken. ‘I nosed my first whisky when I was eight. My father asked me what it tasted of. I said I didn’t really smell anything and he told me to try again, starting with simple describing words such as: is it dry or sweet, heavy or light? ‘He then broke it down further: if it tastes sweet, does it taste like a chocolate bar or a sweet fruit? This was a masterclass in how to taste whisky. It was the day that started my education into the world of whisky. It’s one I will never forget. ‘My earliest whisky-related memory of my dad is of a family party when I was very small, and being aware of the rich aromas of whisky mingling with the sweet, acrid cigar smoke; every time I encounter that mix of aromas, it always recalls that happy memory. ‘My dad is not a big fan of anything overtly peaty; he loves rich, smooth, fruity, vanilla-led whiskies – easy-drinking, yet complex flavour profiles. He adores Dewar’s 12-year-old, and enjoys drinking it neat with ice. He’s also a big fan of Aberfeldy 21, which has a hint of smoke, but it’s very subtle. ‘The first time my father offered me a dram was when we were sailing in West Highland Week. We had just sailed from Oban up to Tobermory, and he opened a bottle of Linkwood, which had been bottled by his independent bottling company, Liquid Gold Enterprises. ‘Obviously there is lots of Kilchoman in the house but, prior to founding Kilchoman in 2005, he would always have a couple of different Islay whiskies; Ardbeg has always been one of his favourites. 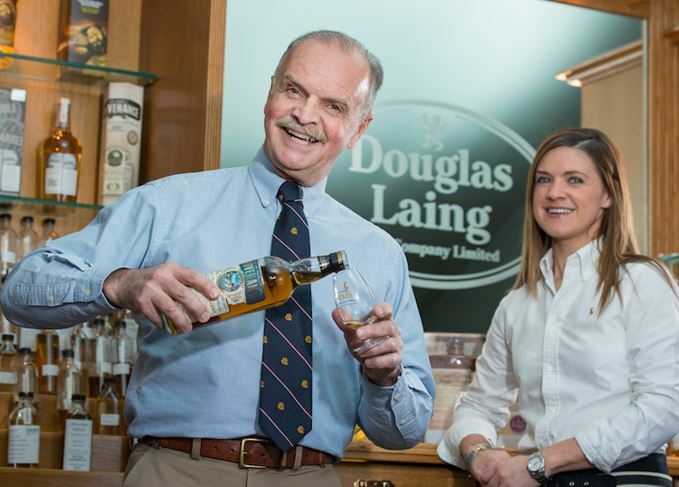 ‘My first whisky memory of dad is concocting a Port Ellen-based hot toddy for me aged about six while I was full of the cold – I was told it would help me sleep and it would “sweat it out” of me! I did not thank him for it at the time… I’d now savour every drop of it! ‘Port Ellen is a definite favourite for Fred as it reminds him of his dad – beyond that he’s a big fan of our Islay vatted malt Big Peat and likewise our Scallywag Speyside malt – he can often be found enjoying a dram of it alongside some dark chocolate. ‘My father was one of the first members to join up to the newly formed SMWS [Scotch Malt Whisky Society], and I became aware that he was amassing some strange-looking, understated vessels at seemingly dangerous alcoholic strength. ‘He was an avid golfer and I guessed that 18 or 19 holes with him out of the house would afford me enough time to perform a proper analysis of this “stuff”. The result was not pretty – I still had a lot of growing up to do and my attempts to restore bottle levels by diluting were eventually rumbled. ‘He passed away more than 30 years ago and is now sipping with the angels, but I owe his love for the game of golf and curiosity for the amber dew to my somewhat early, if ill-prepared, venture into the wonderful world of Scotch whisky. Stuck for Father’s Day ideas? Then spoil your dad this Sunday with a whisky-filled day out. Dave Broom on a trio of grains, a brace of micro-provenance Bruichladdichs and a Tullibardine. Featuring a peaty Angel’s Nectar, two indie grain bottlings plus an impressive 12-year-old blend.